In the mid 19th century as New York City streets continued to grow with immigrants working to make ends meet, the population of homeless youth soared to approximately 30,000. The city was at a loss to solve this problem until the Children’s Aid Society and the New York Foundling Hospital conjured up a unique plan that historians would later call America’s first foster care system. The plan was a simple one: take the orphans living homeless in New York, and relocate them to the West, where there was a need for farmhands, and space for growing families. The first orphan train left New York City in 1854, and many more would follow in its path as the program continued to move children to new homes until 1930. Over the years this program would relocate about 200,000 orphans to new families throughout the West, including the estimated 5,000 who would make Kansas their permanent home. Howard Reed Dowell was three years old when his parents fell through an ice-covered river in Potsdam, New York, catching fatal cases of pneumonia. He and his two other siblings became part of the growing population of homeless youth that roamed New York City and its surrounding communities. The Belleville Telescope on June 25, 1909, reported that a train stopped in town that day, and was greeted by a large crowd from all over Republic County. Families eager to adopt had prepared for the visit well in advance, filling out paperwork to be approved in the event that they found a child. The organizations running these operations hoped to ensure that children ended up in good homes. Dowell recalled the scene in the courthouse as adults pulled children aside to examine them and ask them questions before deciding if any of the children would be a good fit in their home. He remembered that the train returned a week later to make sure the families were adjusting, but the promise to check in the following year didn’t come to be. Dowell says only once an employee from the organization came to check in on the Belleville train that arrived with his siblings, and the 13 other children that remained near Belleville. He and his two siblings were adopted by three different families, but were lucky as they all remained in the same town and were able to stay close growing up. This wasn’t always the case, as sometimes siblings would be separated by several states. Some later reconnected with their families; however, others were never able to locate their family, and those connections were lost. Situations like the one in Belleville played out around Kansas and other states until around 1930 when the trains stopped coming. During the depression many Midwestern towns could no longer support orphans coming into their communities. Additionally, social services had increased in New York, through infrastructure, such as welfare and increased resources for immigrants, which helped keep struggling families together. 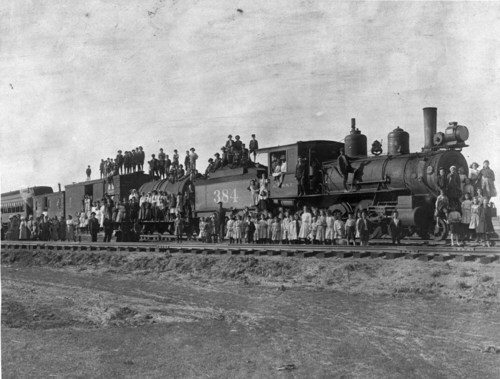 These societal changes led to the demise of the orphan trains. A few of the stories, however, have survived the test of time and help us better understand the history of those who rode the trains to Kansas.